Why in the world would Christians ruin a perfectly great movie with their criticisms and negativity? Finally there is a film about forgiveness that helps people think in an out-of-the-box way about God, so why can’t they just leave well enough alone? Those are the questions you may be asking, and if you follow this link from a well-meaning friend or you saw it posted on The Shack’s fan page on Facebook, welcome! I am one of the “haters” you’ve heard about, and I want to take a moment and explain why I do what I do. First, let me assure you that I don’t have fangs or horns. I’m just a woman who loves God and wants to be pleasing to Him. And I do care very much about taking Him seriously when He commands us to love one another. He wants us to tell the truth always, even if it doesn’t earn us balloons and hearts from people on the Internet. I write because I love His sheep, and do not want them to be deceived or bamboozled in any way by the lies of the enemy of our souls. This enemy hates you, you know. He’s not fond of you at all. And he wants to distort the very nature and character of God so that you will believe a lie. The enemy indeed is the “hater,” and not those who lovingly warn people against his ploys. 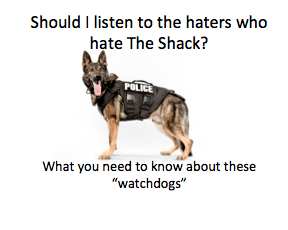 Let’s cut right to the chase: Are there heresies in The Shack? Scroll down. There are more than a dozen of them. Movies about God always make big bucks at the box office, and this one is already headed for mega-blockbuster status after opening in March. Maybe you read the book. Maybe this emotion-tugging story about “Papa” made you think about Jesus for the very first time. But which Jesus? We know that the Jesus of the Bible is very different than the one author William P. Young wrote about in his mega-bestseller. Yes, I know it’s fiction. And I get that the story of forgiving a heinous, unspeakable crime against a child is powerful. I never tell people what not to read or what movies they shouldn’t see. That’s your business. But here’s the thing. If you’re looking for the God of the Bible in this book, or thinking that this is a great film to give your kids a “whole new perspective on God” (we hear that one a lot), then I’m going to speak up and say that there are some things you ought to know about how and where this story veers off track into dangerous waters. First there is the matter of Universalism. Everyone gets into heaven in Young’s story. No sin or repentance, no need for a savior, and no need for a Gospel at all. Last year we interviewed an old colleague of Young’s, James B. De Young, professor of New Testament Language and Literature at Western Seminary in Portland, Ore., who wrote the book, Burning Down The Shack: How the “Christian” Bestseller is Deceiving Millions. Bottom line is, there are many Christians out there who are now warning against this movie and book for the reasons you’ve just read about. If you’ve lasted all the way to the end of this article, then I want to thank you for hanging in there and considering why people like me are so concerned about you. I am glad that you have taken the time to be a Berean (Acts 17:11), and I hope to hear from you in the comments section.